Also get an advanced download. British blues owes a lot to this legendary man called Roger Cotton, producer, song writer, well known musician of huge talent and great sensitivity (those of you who listen to this tremendous fantastic record will immediately realize what I mean). ìA Long Way Backî is the first one he has recorded under his own name and includes fifteen excellent own songs. Roger also plays keyboards and guitar along the whole cd, to back a bunch of high quality bright British musicians like Buddy Whittington, Papa George, Marcus Malone, Paul Cox, Val Cowell, Fay Hallam and Alan Glen. For some years Roger Cotton was member of Peter Greenís Splinter Group and he also has played with John Mayall, B.B. King, Santana and Buddy Guy to only mention four great aces. As a studio musician (he is the owner of Roundel studios) he has been responsible of some Paul McCartney, Eric Bibb, Dr. Feelgood and Peter Green recordings. In short words, it is an ambitious magnificent work that will surprise listeners much more they have expected. The CD also includes a bunch of great musicians that give the best of themselves along the whole album. Anyone with Peter Green's Splinter Group on their CV Is going to know the Blues and be worth listening to. Fortunately, Roger Cotton does not disappoint with this, which is his first ever CD. Roger has been a mainstay of the British Blues scene for many years and has toured with many big names. For "A Long Way Back", he has assembled a crack team of troops, including Buddy Whittington, Marcus Malone and Papa George. The end result is an engaging selection of Blues tracks, with various singers taking it in turns to do the leads. It feels like a relaxed jam session, with friends enjoying each other's company. Many of the songs really swing, including 'Monday Monday', which is sung by Paul Cox. The assembled band switches from bar room Blues to Swing & Jazz, with a real lightness of touch, Which makes the whole project great funbto listen to. There is even a fantastic funky Jazz interlude with “A Day in New York”, which is like the theme from a lost 80’s police television show. This is a fun ride, which keeps the listener hooked to the end. Roger Cotton steps out of the shadows at last. Better known as a sideman (Peter Green's Splinter Group, BB King and Santana are examples) the fifteen songs of A Long Way Back are his own and he has riffled through his extensive contacts book to corralsessioneers and colleagues ofthe highest quality into Roundel Studio. This is polished adult blues/soul of a very high standard. 'Nice Girl Like You' 'and 'No Time For You' are soulful and brassy with a respectful nod to BB King, whilst 'Real World' hews blues energy from the same rich minor-key mine worked successfully by Robert Cray. If there's been a finer example of a clipped funk soul groove than 'I Can't Change' released recently, I've not heard it. Overall. the impression left is of a considered and well thought out Cotton solo project into which long -term collaborators to whom he has given loyalty repay it with respect, professional application and near tangible gratitude. Although Roger Cotton has been active in the music business since the sixties, he has left it until today for his own album under his own name. The reason is that he has presumably had quite enough to do with his work as a composer, studio owner in the English county of Kent, producer for Paul McCartney, Eric Bibb and Dr. Feelgood, among others, and as a member of Peter Green’s splinter group. As someone who knows everybody in the business, his album is adorned by famous names, such as Papa George, Marcus Malone, Paul Cox and many others. The compositions by Cotton himself are really first-rate, extend the mainly rhythm ‘n’ blues in the direction of soul, pop or rock, are often carried and ignited by a ten-piece wind section, and show Cotton himself to be a guitarist and keyboard player worthy of the team, behind alternating male and female singers. In at least three of the 15 songs on the album traces of his experience in film music can be detected. The high point of the album is actually the songs themselves that between urgent power and reticent elegance never omit a single nuance and, despite their differences, form a complete album. And one that you want to listen to again and again. Roger Cotton played for many years with Peter Greenís Splinter Group and the influence of the former Fleetwood Mac leader is plain to hear in the guitar work and vocals on several tracks. So too is a hint of Derek & The Dominoes on "Private Number", but before you run away with the idea that this is a blues-rock set, take a listen to the classic, silky-smooth soul sound of "I Can't Change", which features Detroit bluesman Marcus Malone, as do two other, more directly Blues-styled numbers. The former John Mayall guitarist Buddy Whittington makes a significant contribution to "No Time For You". Roger also enlists the help of many leading figures from the London blues scene: Papa George (try the Rolling Stones tinged rocker "Dangerous Man'", the feted singer Paul Cox, a soulful vocalist in Val Cowell on the strutting title track, multi-instrumentalist Alan Glen and many others. Most of all though, this set is about Roger Cotton, and it reveals an artist with a firm grasp of the blues in all its moods and styles ñ try the instrumental tone poem "A Day In New York" for the most ambitious number, ranging from the almost classical intro via grooving soul-jazz to a slow blues guitar showcase for the finale!. Fans of the British blues sound can buy this CD with confidence. A key figure on the British Blues scene, Roger Cotton is not just an amazingly talented musician but also an arranger and producer very much in demand. It’s surprising to find out that this CD is in fact his first solo album. His name has appeared on so many albums as a producer, arranger or musician and yet Roger Cotton had not released an album in his name. That is until now and with this solo album, there isn’t a shadow of a doubt… he’s produced the best, the very very best of Roger Cotton. All the tracks, all 15 of them (yes fifteen, not like some others who can’t be bothered to give their all! ), are written by Roger Cotton except for two: ‘No time for you’ and ‘Downtown Manhattan’ are co-written with Alan Glen, another figurehead of the Blues made in Britain,. And since Roger obviously wanted to bring out an object of great quality, he has invited a great many singers and musicians: Papa George, Marcus Malone, Alan Glen, Paul Cox, Val Cowell, Fay Hallam and Buddy Whittington and so many more. Among these 15 tracks, there are some real gems like ‘Dangerous Man’, the punchy ‘A Long Way Back’ with the superb Val Cowell on vocals and, of course, ‘Private Number’ sung by the fiery Fay Hallam… this is ‘THE’ track of the album which shows you what Roger is really capable of with a Blues which hits you right where it matters, a Blues which will make you see life so colourful, it looks like fireworks. A special mention for ‘She’s The Wild Wind’ sung by Paul Cox with that voice of his, a wild animal let loose in your sitting-room! So turn up the volume and invite your mates in and play for them the excellent ‘A long way back’ produced by Roger Cotton of course and you’ll soon feel you’re sitting in a London club with the best of British Blues. It’s unmissable! I have a musical Cat: His name is Fat Alan and he taps his right front paw (never the left) to the beat of any song that he really likes: you see his old head start to nod and then the paw gets to bopping. He only does this to the very best  he once fell over whilst solid gone during Lowell’s Rock and Roll Doctor. Only the ace groovers get to Alan’s extremities. So it was with interest that I wound my gramophone and bunged on Roger Cotton’s ‘A Long Way Back”. I was intrigued to see what the combination of the Great Man and so many worthy musical chums would produce, and within a few bars II could tell that Alan and me were in for a good time. I am not going to bore you with a long list of the glitterati and their part in the whole (there’s a joke there somewhere) but if I mention the singers alone: Paul Cox, Buddy Whittington, Marcus Malone, Val Cowell, Papa George and Fay Hallam, you’ll get the picture- big major terrific treat time. Suffice it to say that the guys in back, including of course the splendid Mister Cotton himself, where of the same calibre  the dog’s wotsits. Now add really well put together songs and thoughtful and beautiful instrumental content and round and round, again and again, each time digging out more jewels from the mine. In order to not seem inordinately fulsome I’ll venture just one wee caveat: I winced a bit at the “Dangerous Man” lyrics as, maybe it’s just me, but I don’t like the “Ain’t I the Daddy” school of Blues and if anybody told me he was a Dangerous Man, The urge to pin a “Kick me Hard” sign on him would be hard to resist. As Roger is immensely talented but equally self-effacing we’ll think of this one as a tongue in cheek excursion, the irony of which eluded the obtuse Smig. This is a minor whinge, The album is bloody near perfect, When it ended and Alan stopped tapping his paw he looked up at me raised his paw, extending the inner digit upwards like an opposing thumb. The gesture of approval was unmistakeable. He’s never done that before. Keyboard player, guitarist and producer Roger Cotton is probably best known for his tenure with Splinter Group and he recently backed Buddy Whittington on his UK tour. Whittington is among the many guests on this set, delivering a strong reading of "No Time For You". Marcus Malone and Paul Cox take to the mic for three tracks apiece, Papa George for two, and Val Cowell and Fay Hallon for one each. Three rhythm sections and a pool of horn nine players are on hand, with Alan Glen's always impressive harmonica work added to a few tracks. Eleven vocal numbers that mix blues with R&B and AOR are complemented by four atmospheric instrumentals in a set that oozes class. Roger Cotton is gewoonlijk meer in zijn sas als producer of soundmixer al wordt Roger bij Note records ook wel op handen gedragen voor zijn schrijftalent. Na al dat studiowerk voor anderen wilde Roger wel eens zelf van het succes proeven en verrast ons hier met zijn debuutalbum A Long Way Back. †Ervaring op de bandstand deed Roger Cotton op met de Peter Green Splinter Group en toerde daarmee met zowat alle groten als er zijn BB King, SRV,Buddy Guy en John Mayall. Met zijn ëA Long Way Backí brengt hij als debuut 15 nummers met ëstraight on bluesí. Voor het maken van deze Cd kreeg Roger nu op zijn beurt eens hulp van diverse ëbluesmatesí zoals Buddy Whittington, Marcus Malone en een hele hoop andere klassebakken zoals Alan Glen van de Yardbirds waarmee hij ook samen het album ëBorn in Black And Whiteí opnam. Verscheidenheid troef op dit album van snedige gitaarsoloís als in ëNo Time For Homeí met hulp van Buddy Whittington tot het funky ëA Day In New Yorkí dat door de meester zelf is geschreven en een staaltje is van hoe je mooie muziek kan maken. Luister maar naar de slowblues ëIím Already Goneí. Op dit album neemt Roger Cotton zowel de gitaar als de piano en zelfs het Hammond orgel onder handen. Alle nummers zijn geschreven door Cotton en tevens is hij verantwoordelijk voor het mixen van dit product †en voor ons mag er gerust een vervolg komen als deze bezige bij er tijd voor heeft. 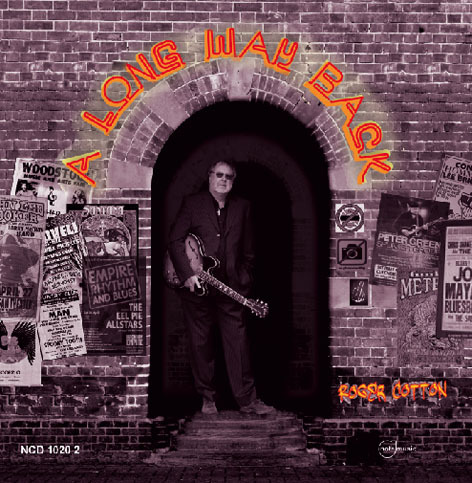 Roger Cotton is usually thought of as a producer and engineer, he is also held in high regards at Note records for his other musical talents performer and songwriter.After years successful studio work making others sound good, Roger surprises us here with its debut album `A long Way Back’. Calling on his experience with the godfather Peter Green Splinters Group and others including BB King, SRV, Buddy Guy and John Mayall etc. With `A long Way Back' as his debut Roger bring 15 tracks with mix of some `straight blues' and more sophisticated music. On the recording of this CD he is aided by several of his `blues mates' such as Buddy Whittington, Marcus Malone and other class musicians such as Alan Glen of the Yardbirds with which he recorded the album `Born in took Black And White'. The stand out tracks on this album are the witty guitar solo on `No Time For Home' with aid of Buddy Whittington and the funky `A Day in New York' that has the master himself feat on many instruments making beautiful music and the luxurious slow blues `I'm Already Gone'. On this album Roger Cotton Produces, Engineers plays Guitars, and keyboards it could sound self-indulgent but in fact it is a tour de force, which oozes class.